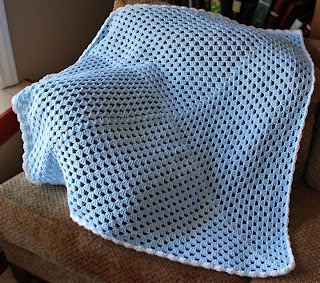 The granny square blanket I contracted to make is finished and ready to go home with its 6-year-old owner. This replaces a blanket that had gotten lost; the little girl knew exactly what she wanted when it came to making decisions about yarn color, pattern, and border. Hope this meets her expectations. I think this is going to be Blanket Month. I started this one - concentric circles of hexagons - just before we left for Quartzsite. 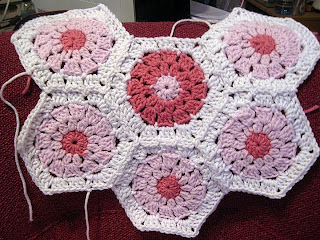 The pattern (here) is a 'how to' for making hexagon motifs and joining them as-you-go. Making the hexagons is fun. Weaving in all the tails is not. I'm trying to finish them off at the end of each round . . . We'll see how long that lasts. 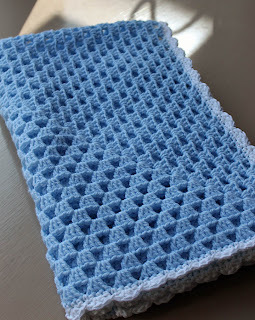 I've also started a baby blanket to be gifted before the end of February. No picture yet, but it's a variation of the Wool Eater Blanket by Sarah London. Gotta get cranking so I have it done in time. Today was our day with 17-month-old Leia. She's such fun to have around - trying to chase the cats (they aren't too worried that they'll get caught), reading books, and typing on grandma's computer (especially when grandma isn't around). She's also started demanding to feed herself at mealtimes. 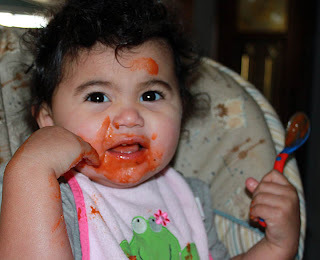 Leia's always been good about getting food into her mouth with her hands. 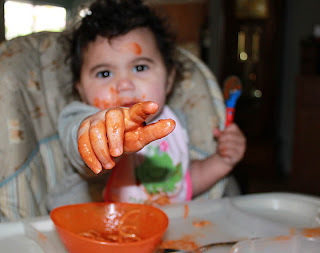 I'm thinking she still needs a little practice with utensils. But she was having fun - and so was grandma. Although I did draw the line when she wanted to touch my new camera. No way I'd ever get all that tomato sauce off the lens.